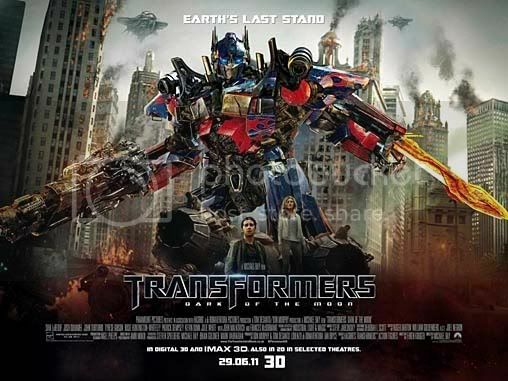 Transformer 3 is screening in cinema! but then i unable to get nice ticket for it. and shin lee wanted to experience Gold Class Movie. so.. i booked the most expensive movie ticket ever. adn 1 week advance. surprisingly i'm not the first person book the seat. Transformer 3: Dark Of The Moon. 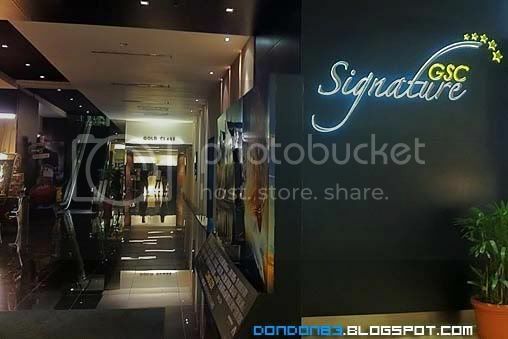 Here we are at the entrance of GSC Signature. located at The Garden. 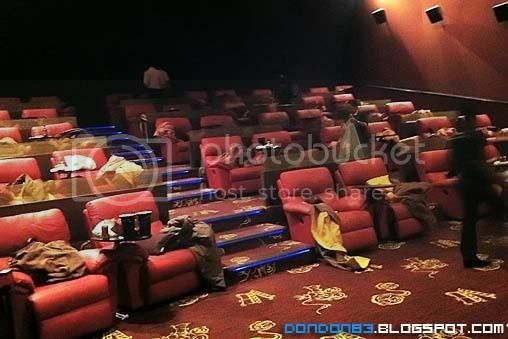 this cinema only screen Premier and GoldClass. no cheap movie here.. 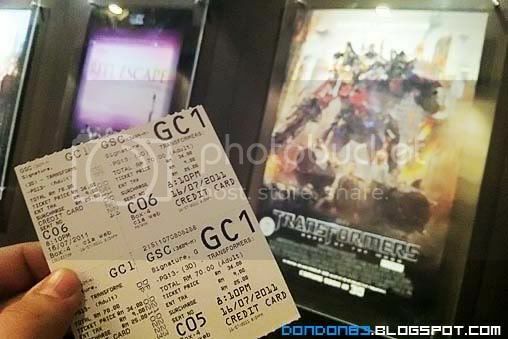 Here's the Transformer Gold Class Ticket. hmph.. same like normal ticket. i tot special a bit tim. 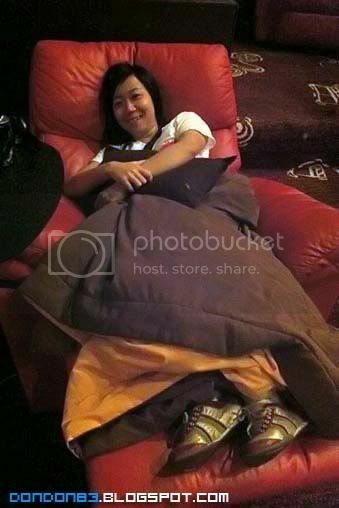 The seat look comfortable, Shin Lee said she though is Massage Chair =_=. Blanket Provided. oh.. include 1 drinks with the ticket purchased. 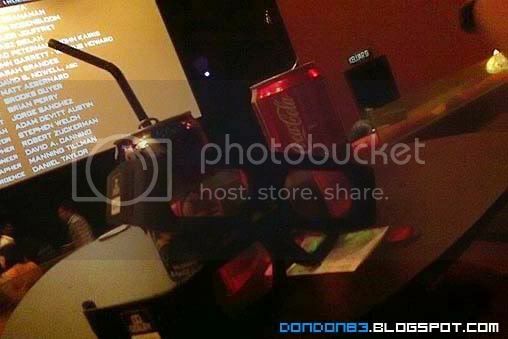 and drinks will placed on your mini table before movie start. Here the Hall Of the Gold Class, only 5 rows and 4 pairs seats a row. and feel comfortable even in 1st row. my advice is, if you feel a bit tired or sleepy. or the movie is boring. 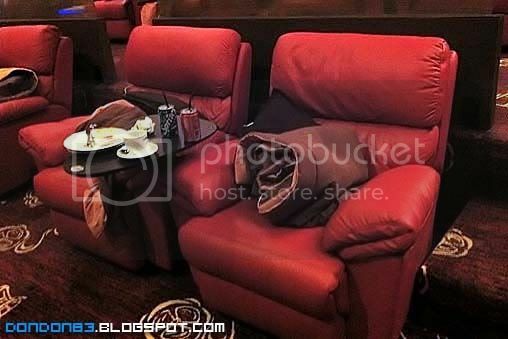 don't ever go for gold class, i tell you why, there is a big chance you will fall asleep under this soft comfortable chair. 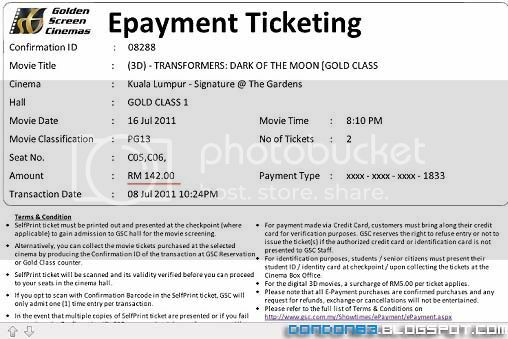 That's is my Gold Class Exprience in GSC Signature. now.. let talk about the movie itself. The Movie.. i heard a lot bad comment about it. so i didn't expect anything much from the movie. and i found it quite good. first time i saw the trailer, it shows Sentinel Prime face, and i though that is the face Unicron which first make appearance in First Transformer Movie. 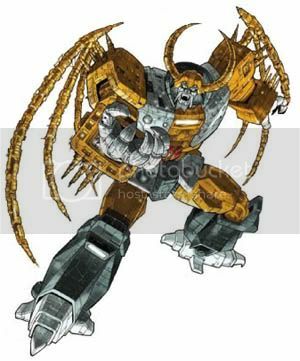 when i noticed it's not unicron after all. 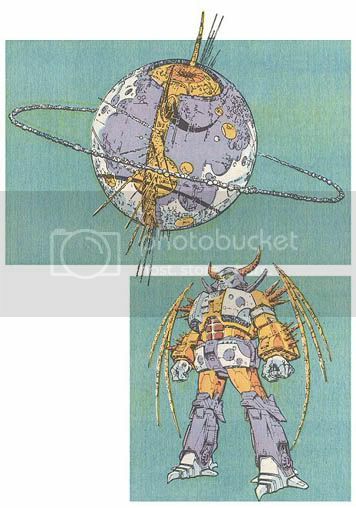 Unicron is can transform into mechanical planet. largest transformer. oh well.. it doesn't make appearance in this movie. for transformer.. my comment is.. don't try to relate it with any previous transformer series. treat it as a totally new transformer, you will find it kinda nice. if you try to compare wtih previous transformer. you will find a lot of thing doesn't make sense.well just a movie.. enjoy it. there the damage.. RM142 for 2 "Gold Class" "3D" in "GSC Signature". the 3D effect is awesome! it's very very details, too bad there is no IMAX3D in Malaysia anymore, if not i will go for second round for it. story line? hmph.. more to Sam Witwicky rather than transformers. the battle is awesome.. but they kill too fast.. running out of time? hmph.. anyway.. it's nice movie to watch.